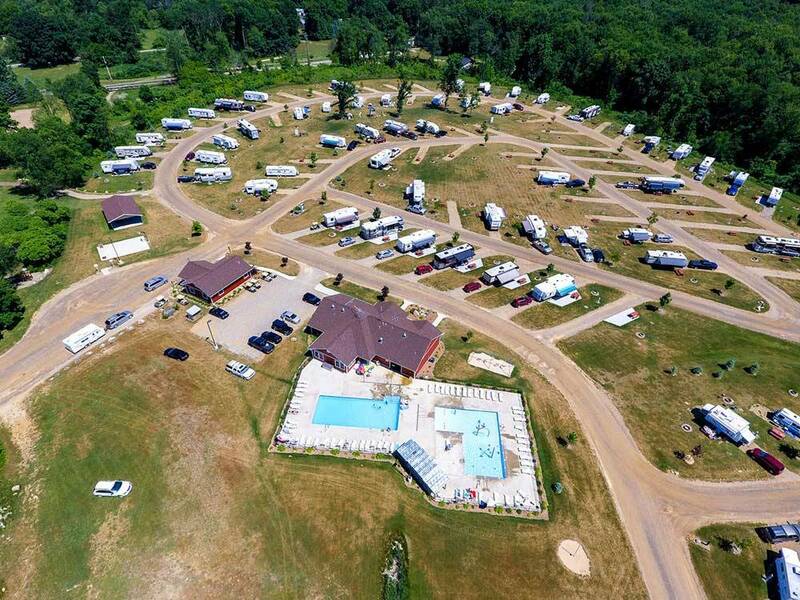 Very nice and new RV park in central Michigan. The sites are a mix of back in and pull through, gravel parking areas with a concrete pad living area with a picnic table. The park has great amenities including two pools, volleyball and basketball courts and a community room with tables and games. The park wifi worked well and the staff was very nice. We highly recommend the park to anyone visiting the area. See our updates, pictures and full reviews on our blog at thegilliamsisland. There are gravel sites and road with lots of room between campsites. Also there is grass on campsite. I have never left a review on Good Sams site, but I felt this one really deserved a 5 star review. We stayed at this resort in a pull through site. The site was gravel, very level with a nice concrete pad on the side. It also had a picnic table. The utilities were centrally located so they were easily reached after we parked. The site easily accommodated our 45 foot class A, with a toad. The grounds are unbelievably clean. There are 2 heated pools, one has a zero entry. The bathrooms and showers are the cleanest I have ever seen, they even had nice artwork hanging on the walls. On site, is a restaurant, and yes, they serve turkey! Full Thanksgiving dinner for me and it was delicious. There is also an ice cream shop an amazing store. The store had a diverse amount of products (kind of Cracker Barrel style), but way better. Fresh baked breads and pastries and more candies by the pound than you can possibly want. We were here on "bike night". a live band was playing outside, beer and turkey legs were served on the patio. I took a long walk after dinner, there is another store out back, I peeked in the windows, it was after 8 pm so I wasn't surprised it was closed. I hope I am lucky enough to check it out tomorrow. There is a "kids" railroad track, it looks pretty amazing, but it doesn't open until June 10th. There are also multiple play areas for kids, a lake, a bunch of really big, live turkeys (they don't eat the ones that live here). Goats and cows. Note the signs when you drive in, go past the restaurant and store, then turn into the campground. The check in area is past the barn. More than anything, I would like to mention the kind folks that checked us in. Warm and smiling, cheerfully showing everything about the place. They are the ones that told us about the food and store. I can't tell you how wonderful they were. Stop by here, you won't regret it. To date this has been the best campground that we have stayed at. The pools, laundry room, bathrooms and store are pristine. Can't wait to stay again for Memorial Day weekend 2016!!! The staff was very friendly and the park very clean. We were at the end of season and the park was maybe 1/8 full. The park is convienently located near some sightseeing spots. 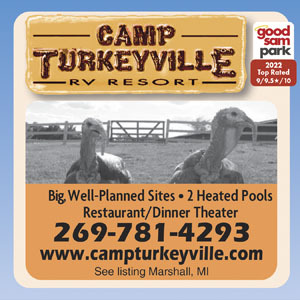 Camp Turkeyville would be a lot of fun for children. We attended a murder mystery in the dinner theatre and it was extremely funny. They had some long sites which were around 90' and wide enough roads we had no problem. The wifi was not the best, but I never rely on a parks wifi as most of them are not very good. We would definetkly recommend the park and stay again. A very nice campgrounds. Large sites, and a lot of actives at the campground. Some of the sewer dumps are up hill. Fairly new campground, large sites, nice pool, friendly staff. Close to the towns of Marshall and Battle Creek. Lousy WiFi if you can get it at all. From Jct of I-69 & Exit 42 (N Dr & Turkeyville Rd), W 0.9 mi on Turkeyville Rd (L) Note: Go through blinking light at intersection. Pull into Turkeyville main lot on N Drive. Park drive is on the west side of the main lot.